Schizophrenia is a complex illness that produces many different problems. Before attempting to communicate with someone who has schizophrenia, make sure you are ready. Make sure you have calmed down if you have been frustrated by the person’s behavior. Begin the conversation when you can project a reassuring presence. Select just one issue or problem to discuss during any one conversation. Trying to discuss more than one won’t be productive. Focus on specific steps or ways to improve or change behavior, rather than voice complaints or make accusations. Provide a calming presence. Use a steady, neutral tone of voice to convey your emotional steadiness. This can be reassuring to someone who is troubled by their own thoughts. If the person is intellectually impaired, communication likely will require significant patience and understanding on your part. Avoid “baby talk” or talking down to the person. Use a gentle voice. Use simple sentences if the person has trouble following you or seems confused. If necessary, repeat what you have to say if the person has trouble concentrating or remembering. Show compassion. 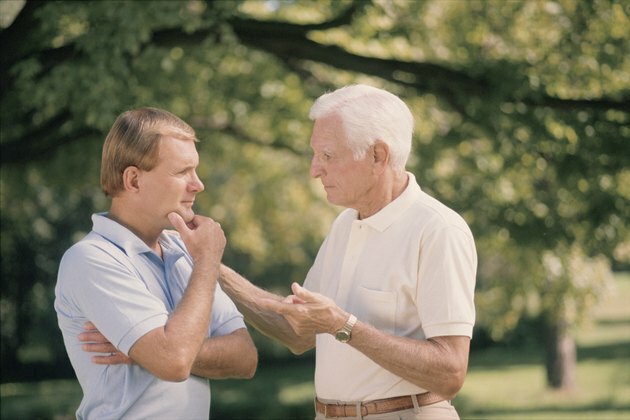 The British Columbia Schizophrenia Society offers this advice when communicating with someone who has schizophrenia: Don’t argue with someone who has delusions. You cannot change them. Acknowledge the effect a delusion or hallucination must have on the person. Be sympathetic and express understanding. Reduce distractions around the individual. Limit noise and people. Offer support. Happy talk or cheery chatter won’t help someone who is likely to experience problems associated with schizophrenia, including depression, poor self-image and a sense of insecurity. You can, however, provide reassurance that you will always be there to provide support. Let the person know she will never be alone. You can remind the person of past accomplishments and the likelihood there will be similar accomplishments in the future. Before you sit down to talk to someone who has schizophrenia, it is best not to think of him or her as a “schizophrenic,” just as it is best not to think of someone with heart disease as a “bad heart.” A person with an illness is not that illness. Separating the individual from the illness will help you in your interactions. How you communicate will therefore depend on the traits of person to whom you're speaking. Some people with schizophrenia function at a high level, others do not. Tailor your conversation to the ability of the person to understand. Wait for the best time to engage the person. If the person appears to be “in their own world” or distracted by hallucinations, you will have to wait until he is more receptive. If someone is distracted, agitated or excited, let her settle down emotionally before initiating a conversation. Don't expect someone with schizophrenia to be very sympathetic to your problems. Don't take it personally. The disease often poses a burden that prevents much understanding of others' problems.